A collaboration led by scientists at the University of Maryland (UMD), the U.S. Department of Energy's (DOE) Brookhaven National Laboratory, and the U.S. Army Research Lab have developed and studied a new cathode material that could triple the energy density of lithium-ion battery electrodes. Their research was published on June 13 in Nature Communications. "Lithium-ion batteries consist of an anode and a cathode," said Xiulin Fan, a scientist at UMD and one of the lead authors of the paper. "Compared to the large capacity of the commercial graphite anodes used in lithium-ion batteries, the capacity of the cathodes is far more limited. Cathode materials are always the bottleneck for further improving the energy density of lithium-ion batteries." "The materials normally used in lithium-ion batteries are based on intercalation chemistry," said Enyuan Hu, a chemist at Brookhaven and one of the lead authors of the paper. "This type of chemical reaction is very efficient; however, it only transfers a single electron, so the cathode capacity is limited. Some compounds like FeF3 are capable of transferring multiple electrons through a more complex reaction mechanism, called a conversion reaction." Despite FeF3's potential to increase cathode capacity, the compound has not historically worked well in lithium-ion batteries due to three complications with its conversion reaction: poor energy efficiency (hysteresis), a slow reaction rate, and side reactions that can cause poor cycling life. To overcome these challenges, the scientists added cobalt and oxygen atoms to FeF3 nanorods through a process called chemical substitution. This allowed the scientists to manipulate the reaction pathway and make it more "reversible." 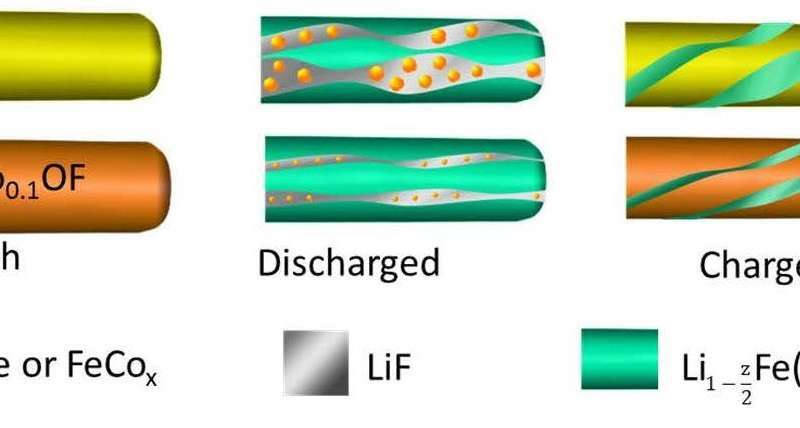 "When lithium ions are inserted into FeF3, the material is converted to iron and lithium fluoride," said Sooyeon Hwang, a co-author of the paper and a scientist at Brookhaven's Center for Functional Nanomaterials (CFN). "However, the reaction is not fully reversible. After substituting with cobalt and oxygen, the main framework of the cathode material is better maintained and the reaction becomes more reversible." 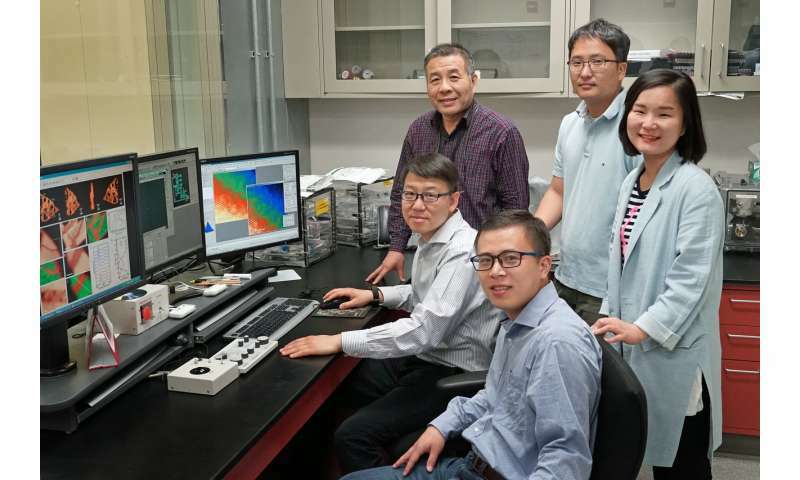 "TEM is a powerful tool for characterizing materials at very small length scales, and it is also able to investigate the reaction process in real time," said Dong Su, a scientist at CFN and a co-corresponding author of the study. "However, we can only see a very limited area of the sample using TEM. We needed to rely on the synchrotron techniques at NSLS-II to understand how the whole battery functions." At NSLS-II's X-ray Powder Diffraction (XPD) beamline, scientists directed ultra-bright x-rays through the cathode material. By analyzing how the light scattered, the scientists could "see" additional information about the material's structure. "At XPD, we conducted pair distribution function (PDF) measurements, which are capable of detecting local iron orderings over a large volume," said Jianming Bai, a co-author of the paper and a scientist at NSLS-II. "The PDF analysis on the discharged cathodes clearly revealed that the chemical substitution promotes electrochemical reversibility." "We also performed advanced computational approaches based on density functional theory to decipher the reaction mechanism at an atomic scale," said Xiao Ji, a scientist at UMD and co-author of the paper. "This approach revealed that chemical substitution shifted the reaction to a highly reversible state by reducing the particle size of iron and stabilizing the rocksalt phase. "Scientists at UMD say this research strategy could be applied to other high energy conversion materials, and future studies may use the approach to improve other battery systems. It'll be great to have safer energy storage than gasoline.